“Isla Mujeres and Chetumal were the only two destinations in Quintana Roo where hotel occupancy grew during 2018, with variations of 6.69 and 5.1 percentage points respectively, compared to 2017”, revealed the latest Sedetur report. The document indicates that Isla Mujeres went from 64.82% to 71.41%, while Chetumal -the destination with the lowest percentage occupancy- went from 44.7% to 49.8%. The report of the State Tourism Secretariat (Sedetur) measures the occupation divided into five regions or destinations: Cancun and Puerto Morelos, Cozumel, Riviera Maya, Isla Mujeres and Chetumal, the first three with a slight drop. The historical comparison shows that Cancún and Puerto Morelos lost 1.6 points, as they went down from 81.42% in 2017 to 79.82 in 2018. In the case of Cozumel, the average occupation for 2017 was 67.08% and one year later it was 65.66%, a decrease of 1.42 percentage points. The Riviera Maya, which includes all the resorts from Playa del Carmen to Tulum, was the destination with the the most significant decrease in terms of occupancy during 2018, going down 2.53 percentage points, as the region went from 82.93 to 80.45, reaffirming what the Association had calculated at the beginning of the year, an approximate a loss of 3%. Conrad Bergwerf, president of the Association, said at the time that the loss was caused by sargassum and the facts related to insecurity. 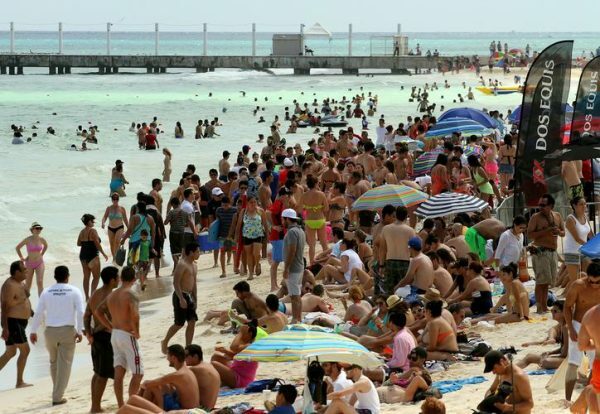 Despite the setbacks of its two main destinations, Cancun and Riviera Maya, the state of Quintana Roo registered a 69.42% occupancy during 2018, surpassing what was achieved in 2017 when it stood at 68.19%, according to the Sedetur’s statistical report. The occupation report is the prelude to the Annual Report that the Ministry of Tourism will announce in the coming weeks, and that includes the entry of tourists to the state including their place of origin, income of cruise passengers, among other variables.